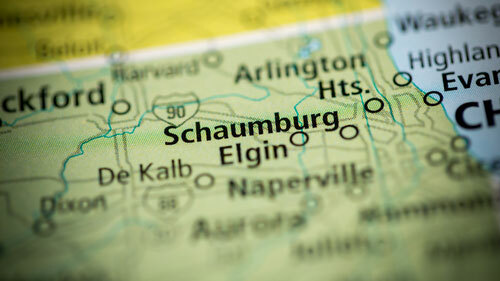 The City of Schaumburg is most noted for its links to some of the world’s largest technology companies, which have chosen the city for their world or North American headquarters, but among its 5,000 employers include numerous manufacturers and transportation companies. The Schaumburg workers compensation attorneys of Rosenfeld Injury Lawyers LLC consider it our duty to protect the interests and rights of every worker who goes to work each day knowing that he or she may be injured in a workplace accident. It is far too common that insurance companies representing victims’ employers take advantage of those who are already down and we will fight on your behalf to maximize your financial recovery. If you or a family member was injured on the job and are in need of a Schaumburg workers compensation lawyer, contact Rosenfeld Injury Lawyers LLC today for a free consultation. Schaumburg has gained notoriety for hosting large multinational companies that include the likes of Motorola Solutions, Zurich American Insurance, IBM, Verizon Wireless and Comcast. It is easy to overlook the manufacturers that contribute to its workforce and economy, but these companies include Pepsi, Nation Pizza Products and Earle M. Jorgensen— a prominent player in the nation’s steel distribution network. The Gonnella Baking Company operates its production plant out of Schaumburg as well. Komet of America is also located in Schaumburg and produces machine tools used for industrial applications. There are a total of 75,000 workers employed throughout Schaumburg. Every one of these workers has the right to receive workers’ compensation benefits, even if they are injured while working in low risk occupations. If you have been injured on the job, however, you may not be aware of all of the avenues available for you to collect the compensation you are entitled to. Our Schaumburg workplace accident lawyers can help you review your options and give you the information you need about your rights so that you can make educated decisions about how to proceed with your claim. You should never be fooled into thinking that you need to prove your employer is at fault for your injuries in order to collect workers’ compensation benefits. Regardless of whether you work in a white collar or blue collar profession, you have the same guarantees through state law regarding the ability to recover compensation when you’ve been injured. The many injuries that occur on the job include the following. Overexertion and repetitive motion— whether you are working behind a keyboard or operating an industrial machine for a living, repetitive motions and overexertion can result in injuries that require expensive medical treatment. Carpel tunnel syndrome is commonly the result of using your hands for eight hours a day. Overexertion is the most common cause of workplace injury in the state. Loss of limb and disfigurement— working in a factory places you in close proximity to large and powerful machines. One of the most common causes of injuries in industrial settings is having limbs or digits caught in pinch points where moving parts come together. This can result in the immediate loss of the limb, permanent disfigurement or the eventual need to amputate. Slips, trips and falls— a cluttered work space is dangerous, regardless of whether it is an office, a construction site or the floor of a production facility. These accidents can result in injuries as minor as bumps and bruises or as major as broken and dislocated bones, traumatic brain injuries, damage to internal organs or death when falling from great heights. Employers are required to provide a safe work environment and provide warnings to employees whenever surfaces are wet or uneven in order to prevent these types of accidents. Transportation and logistics injuries— working in the transportation industry can be extremely dangerous. Accidents occurring while loading or unloading trailers or when truck drivers act negligently are more likely to result in fatalities than accidents in any other industry. Hazardous materials— factory and utility workers are often exposed to materials that can have an immediate or long term impact on their health. Corrosive chemicals, toxic fumes and other hazardous substances can be the source of injury, especially when workers are not properly warned about the dangers or provided adequate personal protection equipment. As you are already aware, you have the right to receive workers’ compensation benefits following any workplace accident, but our Schaumburg workers compensation lawyers will seek any additional avenue to collect compensation on your behalf when these benefits are not enough. Here are some of the ways we will seek to recover the financial compensation required to help you pay for your medical bills and other expenses that you’ve incurred due to your injuries. Filing a workers’ compensation claim— when you’ve been injured, you are guaranteed these benefits regardless of whether the accident was your fault or not. Your employer is required to cover the cost of your medical care and pay two-thirds of your wages throughout your recovery period. You are also entitled to additional compensation if you are disabled because of your injuries. The Illinois Workers’ Compensation Commission handles all workers’ compensation claims and the nearest hearing site is located at the Elgin Community College at 1700 Spartan Drive, Building E in Elgin, IL 60123. Seeking compensation from a negligent employer. If your employer did not take proper measures to provide a safe work environment or a co-worker’s negligence resulted in your injuries, you can file a lawsuit against your employer to cover the value of your pain and suffering and out of pocket expenses. In cases where your employer has acted especially reckless, you may even receive punitive damages. Filing a third party lawsuit. In some cases, workplace accidents are the result of a defective or poorly designed product. When this is the case, we will seek compensation from the manufacturer of the product that injured you in order to ensure your past and future expenses are recovered. Rosenfeld Injury Lawyers LLC is an award-winning Illinois workers compensation law firm that is dedicated to helping you with your physical and financial recovery. In order to help you return to good health and ensure you can afford the treatment you deserve, we rely on an extended network of the finest doctors and medical specialists. This allows us to help you receive high-quality care while we seek the compensation needed to cover the costs. Our Schaumburg work comp attorneys have a track success of recovering the maximum amount of damages allowed by state law on behalf of our clients, so you can let us focus on the financial aspect of your recovery while you focus on your rehabilitation. Contact us today to arrange a risk-free consultation and case review with one of our highly qualified Schaumburg workers compensation lawyers. We will review your rights and legal options before launching a thorough investigation into your accident to determine which avenues are available to secure damages on your behalf. We do this all on a contingency basis for you, so if we are unable to help you recover the compensation you deserve for your injuries, our services won’t cost you a thing.